If you were going to build a movie set that looked like an old medieval town, this is what you would end up with. The maze of cobblestone streets, timber buildings peering over them, different colours everywhere and a church perched high on a hill. You can imagine cameras on cranes sweeping across the marketplace, a catering truck hidden just out of shot near one of the town’s gates, a director shouting ‘cut’ as men in costumes ride their horses out of shot. Everything is just so perfect, I think to myself as I wander through the town. But this is not a movie set, this is not a theme park or some artificial history world. 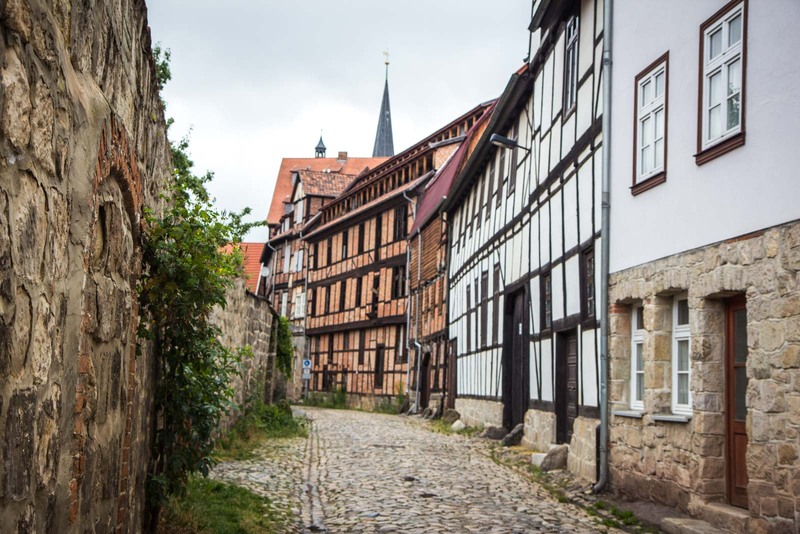 This is the German town of Quedlinburg and it has been like this for centuries. The town wall was built in 1330 and has been preserved since then. 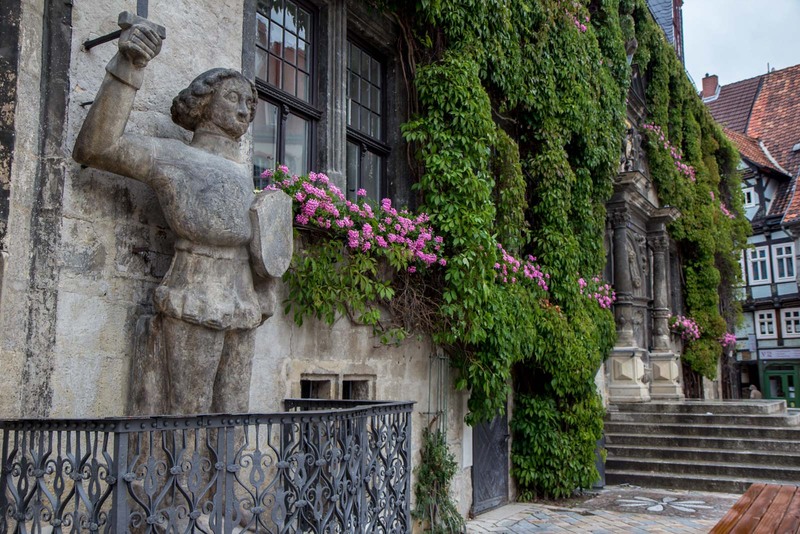 It means the authentic Middle Ages urban layout has hardly changed in the 700 years that have passed. 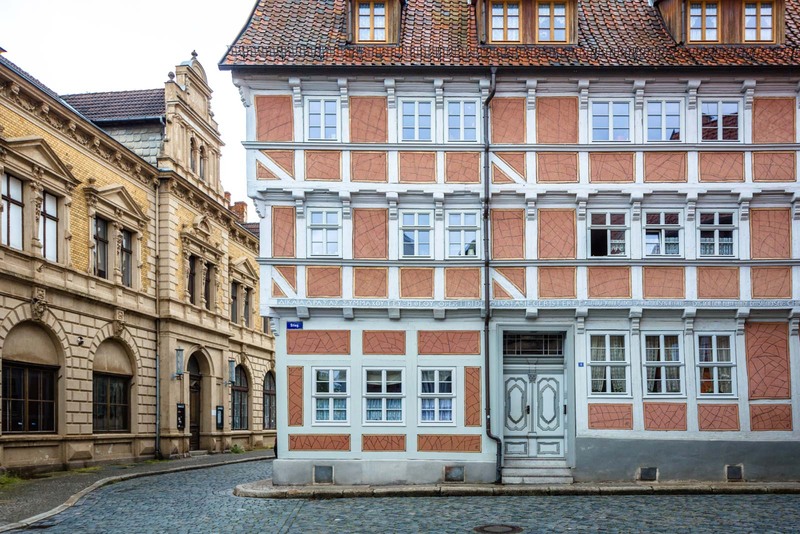 The street pattern is a near-perfect representation of the way a medieval town developed and can be used by historians to study how other similar towns in this part of the German Empire probably looked. 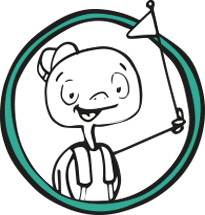 For the average visitor, though, understanding the layout of the streets is probably most useful to avoid getting lost. As I wander through without a map, I lose my sense of direction a few times. Quedlinburg is not overly large and it’s easy enough to find something that helps with my bearings. Not that I mind getting lost. Each new street has something else to look at. 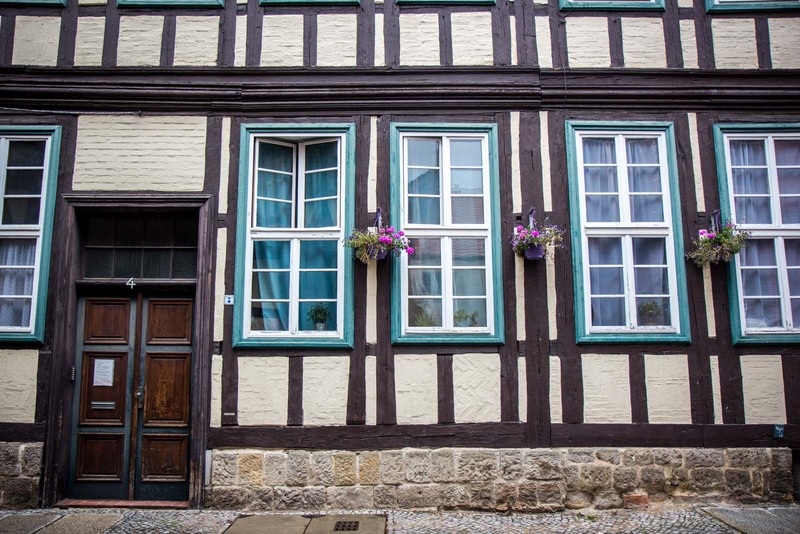 The timber-framed houses are each beautiful in their own way with the exposed beams and painted walls. Together, though, in a line, that’s when the colours create wonderful patterns as you walk along in either direction. Everything is so well maintained and so clean, I wonder again whether this is really a town where people live or a movie set made for a sole purpose. 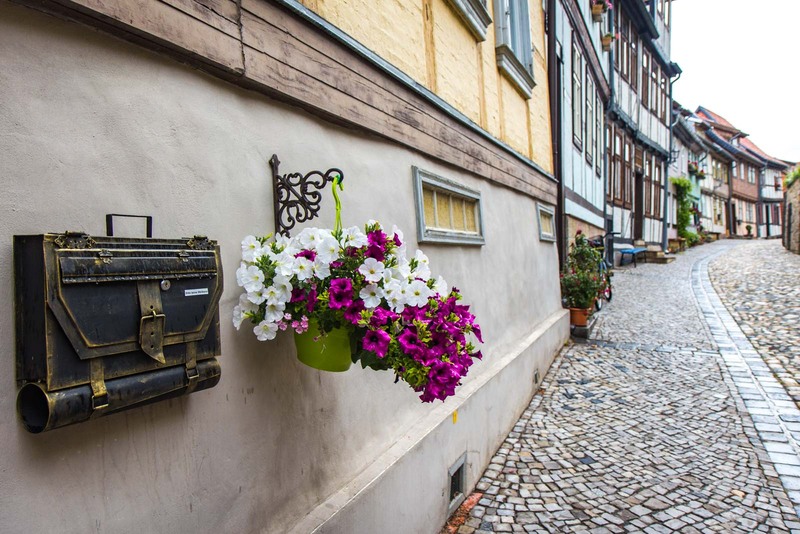 Exploring the streets of Quedlinburg is the best thing you can do and, with so many streets going off in different directions, there are lots of different angles and scenes to discover. 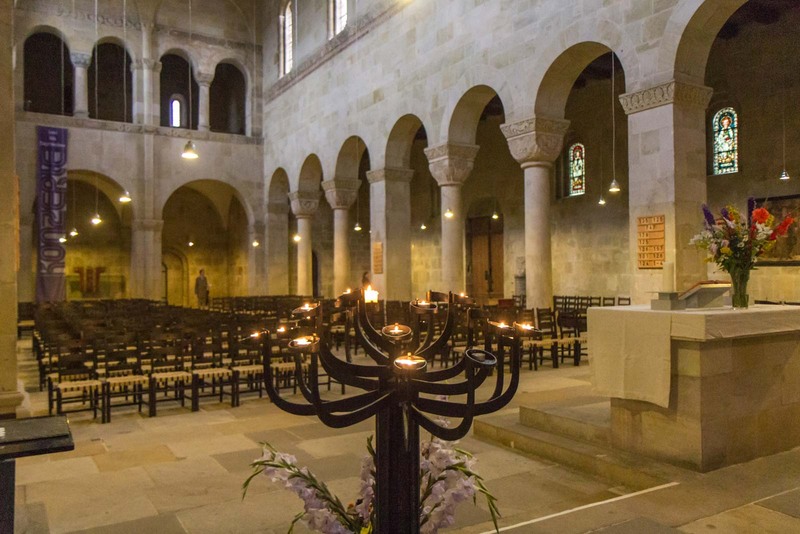 The most important building in the city is the Collegiate Church of St Servatius and it is not to be missed. Its crypt, with cross vaults, capitals, tombs, and murals, is generally considered to be one of the most significant monuments in the history of art between the 10th and 12th century. You can get to the church by walking up the hill at the edge of town. The large terraced area at the rear of the building has great views out over the city as well. 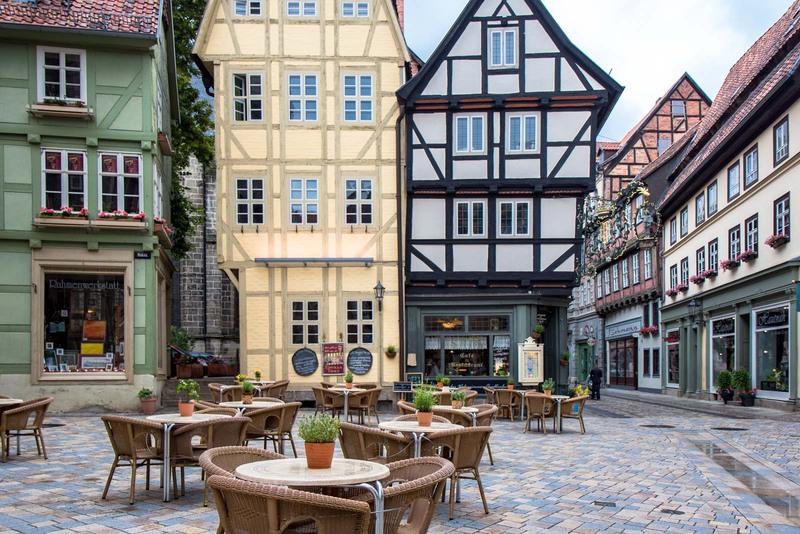 Many people visit Quedlinburg as a day trip but it’s certainly worth staying overnight if you have time. The centre of town is much quieter than during the day so the early evening is the perfect time to walk the streets and take some photographs without lots of people in them. Wow, that place looks amazing! Thanks for sharing. It’s a really beautiful place. I’d never heard of it but really loved my stay there (especially in the early evening when the crowds had gone). Wow, this place really looks perfect and definitely a place I would visit! Love the architecture of its buildings and I really wouldn’t mind getting lost here either. Isn’t the architecture stunning?! And I loved that it’s like this through most of the old city – not just one or two streets. It’s why you can walk through it all for so long. What a beautiful town! It really does look like a movie set. Love the colorful facades. I bet they do film movies there sometimes – it would make sense, wouldn’t it? Ha! A good question! Because I stayed the night in Quedlinburg, I pretty much had the place to myself in the early evening. A lot of people come in as tour groups to see it and they have all gone by the afternoon. I’m so glad I was there for a bit longer!! Gorgeous photos! 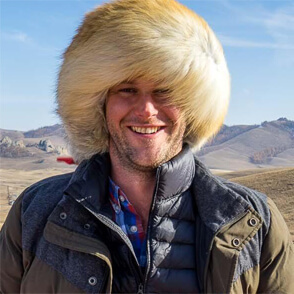 I found your site in some Pinterest research. 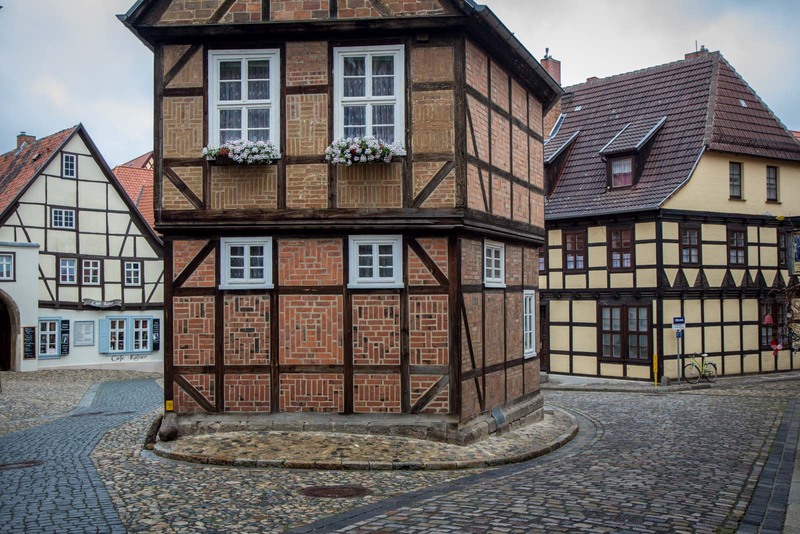 I’m headed to Quedlinburg next week, never heard of it before. Now I can’t wait! Let me know what you think. I thought it was one of my favourite small towns in Germany and I really couldn’t get enough of the atmosphere there. But I’m not sure whether everyone else would think the same so would be curious to hear your thoughts. There is a staircase climbing up a hill named Münzenberg, 250 meters W-NW from the collegiate church, across the parking lot at Wipertistraße and Mühlenstraße. Go climb it: It is open to public! 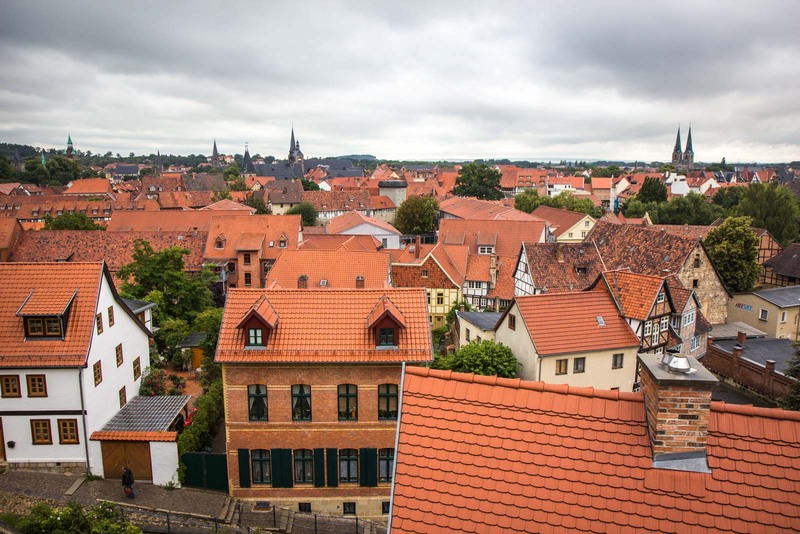 Not only Münzenberg is a charming place (Feels like a small countryside village of half timbered houses around a main square), but the view from up there on the city and the church is gorgeous, particularly at sunset : This is actually the shot you see on every brochure and postcards ^^. Thanks again for the wonderful pictures and taking me back in time.